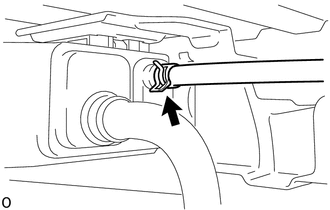 (a) Loosen the hose clip and disconnect the charcoal canister fuel hose. (a) Push the fuel tank vent hose deep inside. 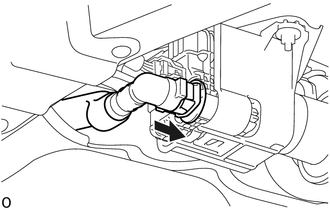 (b) Pinch portion A to disconnect the fuel tank vent hose as shown in the illustration. Remove any dirt and foreign objects from the fuel tank vent hose connector before performing the work. Do not allow any scratches or foreign objects on the parts when disconnecting, as the fuel tank vent hose connector has the O-ring that seals the pipe. Perform the work by hand. Do not use any tools. Protect the disconnected part by covering it with a vinyl bag after disconnecting the fuel tank vent hose. If the fuel tank vent hose connector and pipe are stuck, push and pull them to release. (b) Disengage the clamp to separate the wire harness. 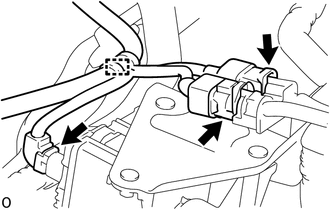 (d) Disengage the guide to separate the wire harness bracket. (e) Remove the bolt, 3 nuts and charcoal canister assembly. (a) Push the fuel tank vent hose sub-assembly deep inside. 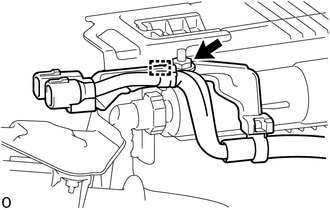 (b) Pinch portion A to disconnect the fuel tank vent hose sub- assembly as shown in the illustration. 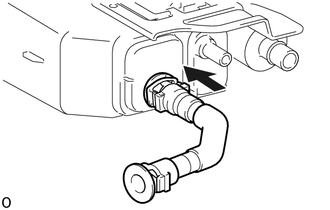 Remove any dirt and foreign objects from the fuel tank vent hose sub-assembly connector before performing the work. 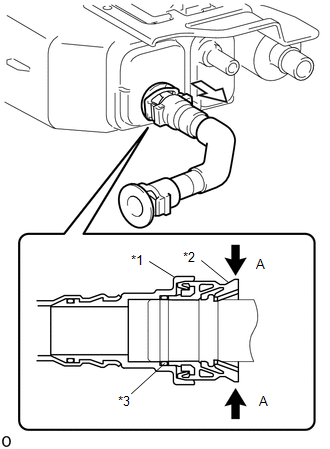 Do not allow any scratches or foreign objects on the parts when disconnecting, as the fuel tank vent hose sub-assembly connector has the O-ring that seals the pipe. 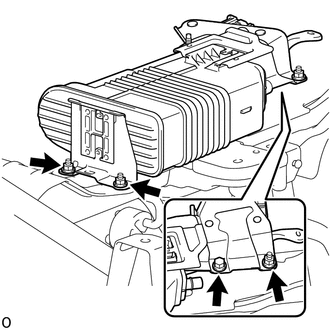 Protect the disconnected part by covering it with a vinyl bag after disconnecting the fuel tank vent hose sub-assembly. 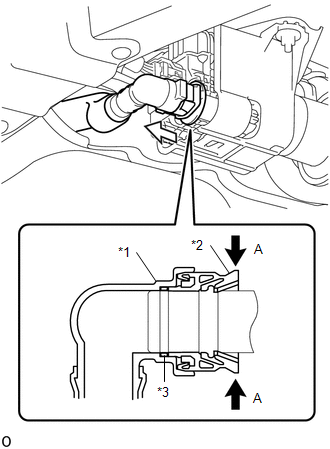 If the fuel tank vent hose sub-assembly connector and pipe are stuck, push and pull them to release. (a) Before removing the leak detection pump sub-assembly, clean the canister by blowing air into it to ensure that the canister is free of foreign matter. Make sure to clean the canister using only air. Do not use gasoline, thinners or solvents. 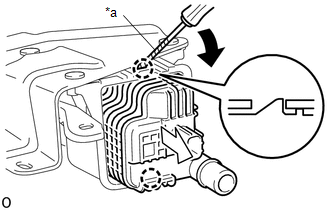 (b) Using a screwdriver with its tip wrapped in protective tape, disengage the 2 claws to remove the charcoal canister leak detection pump sub-assembly as shown in the illustration. (c) Check if the charcoal canister assembly contains foreign matter such as mud or water. (1) Visually check that the inside of the charcoal canister assembly is free of foreign matter. (2) Hold the charcoal canister assembly upside down to make sure that the charcoal canister assembly is free of foreign matter. If the charcoal canister assembly contains foreign matter, replace the charcoal canister assembly.